What does democratic education look like from the perspective of music? In October 2015, the ArtsEqual research initiative was launched to survey equality in various branches of the arts. At its centre is Resonaari, a music institute leading by example to show what potential musicianship may be found in the margins of society. Democratic education has been a guideline in Finnish society for a long time. Educational planning today is governed by a conception of learners reflecting ideals of humanism and participation: every human being is respected as an individual and a full member of society. It is an accepted value in music education and in education policy applying to music that “music belongs to everyone”. The democratic ideal has led to education in Finland being largely institutionalised in the interests of the common good, for the benefit of citizens. A significant milestone in this respect was attained with the establishment of the comprehensive school system in the 1970s. Democracy is easily equated with homogeneity: providing the same things to everyone in the same way, in the interests of equal distribution of the common good. Institutionalisation has to do with socialisation. The flip side of this is that structures may become ossified, leading to educational organisations becoming isolated and stagnated. This causes them to lose flexibility and the sensitivity to respond to changes in the culture around them. In music education, institutionalisation has manifested itself most conspicuously in the establishment of the music institute system in a ‘pyramid model’ over recent decades. In this system, talented students can be effectively supported and nurtured from the beginning of their learning path. However, recent research in music education has criticised the music institute institution for upholding undemocratic and exclusive practices, such as measuring the aptitude of applicants in entrance examinations. The argument in such criticism is that the discourse emphasising talent often ignores the big picture of the entire population – the fact that music has value as a component of growth, humanity and well-being for every citizen. Although basic education in the arts is governed by the principle of equality enshrined in the Act on Basic Education, there are nevertheless restrictions on participation and on opportunities for musical growth imposed by age, health, learning disabilities and so on. How can art cope with democratisation? So what exactly does democratic education mean in music education, and on whose terms should it be promoted? The historical approach shows that efforts to attain institutional democratic education have led both to inclusion and to exclusion. It may be surprising to realise that practices we think of as democratic may actually categorise and marginalise. In my doctoral dissertation in music education, I seek to identify such practices and structures and to encourage alternative perspectives: could a radical change in the music education institution from the equality angle lead not only to democratic education but to improved quality at all levels of education? My study forms part of the multi-disciplinary research initiative The Arts as Public Service: Strategic Steps Towards Equality (ArtsEqual) funded by the Strategic Research Council of the Academy of Finland and coordinated by the University of the Arts Helsinki. Its purpose is to identify and dismantle mechanisms of inequality in arts education and to make recommendations for policy actions to foster structural changes that promote the accessibility of arts education. In order to better understand the inclusive and exclusive mechanisms of institutional music education, we must consider the perspective of social marginalisation. In the historical perspective, trends of change in society originate in the margins and migrate towards the mainstream, from small to large. Therefore in this study I consider learners in the margins and their teachers to be progressive activists whose activities will provide the impetus for reinforcing democracy in Finnish music education. By “marginal” I am here referring to those learner communities and population groups for whom the traditional Finnish music institute system is not an option for participation in musical activities. It is important to realise that in this sense these people are “marginal” only with respect to the music education institution, not with respect to their personal characteristics. Founded in the 1990s and authorised by the National Board of Education to provide basic education in the arts in 2004, Resonaari is a music institute based in Helsinki that has brought an alternative approach to the Finnish music education system. It facilitates goal-oriented musical activities and vocational education in music for people excluded from ordinary music institutes. Resonaari operates on the principle that persons in need of special support should not be offered music only as a form of therapy; everyone should be allowed to participate in goal-orientated music education according to the advanced syllabus in basic education in music. The idea is to respect every individual’s learning potential and to support them as makers of music regardless of their physical or cognitive abilities or their skill levels. Resonaari offers students and their family members participation opportunities by supporting holistic music learning and by creating social networks through musical activities. Resonaarigroup is an ensemble of six professional musicians. The unconventional and unprejudiced pedagogical operations of Resonaari have highlighted phenomena that reflect a change in our conception of musicianship, the most recent such phenomenon being the punk band of four men with developmental disabilities Pertti Kurikan Nimipäivät, which represented Finland at the Eurovision Song Contest in 2015. Some of the band members are alumni of Resonaari, which played an important role in their musicianship. In addition to running a music school, Resonaari launched the Resonaarigroup project a couple of years ago with the idea of providing vocational education in music. The purpose of the project is helping developmentally disabled persons to receive vocational tuition and to find employment as musicians. Two young men in the project have led music workshops for music education students at the University of the Arts Helsinki. They are distinctly unconventional in their personality and other characteristics if compared to a “normal” teacher, but they bring new ways of learning, communicating and understanding musical activities to the interaction situation, as they – traditionally the ones regarded as requiring teaching and support – take on the role of the teacher. Resonaari also helped launch Riskiryhmä, a rock group for elderly women. The members of this group had never had a meaningful relationship with music in their extensive life history; indeed, some of them had had negative experiences of music. Amateur musicianship at an advanced age has brought them gratification in learning new skills and has also improved their social life. Playing in a band has encouraged them to embrace new situations and roles. This serves to open up new perspectives for life after employment. Becoming a rock musician is also for them a tool for processing their personal experiences of ageing and their roles in society. These Riskiryhmä ladies began playing rock music at an advanced age. The notion that it is impossible to learn to play music at an advanced age is a white elephant in music education. It is perhaps why traditional music institutes offer no instruction for the older population. Goal-orientated later adulthood music education will hopefully become more common in the future, because it represents a step towards music education that not only is democratic but also embraces lifelong learning. The examples given above illustrate a chain of events where musical interaction in the here and now triggers an attitude change in the individual that reflects a broader change in education policy and ultimately a change in society at large. Our conception of human beings is shifting, and there are many weak signals that our attitudes to groups of people living in the margins of society, such as the elderly and persons with disabilities, are changing. Old stereotypes give way to new stories. Music education is facing issues that are far too complicated to be resolved in the context of the discourse on “musicality”, skill or talent that has conventionally governed practices and educational goals. 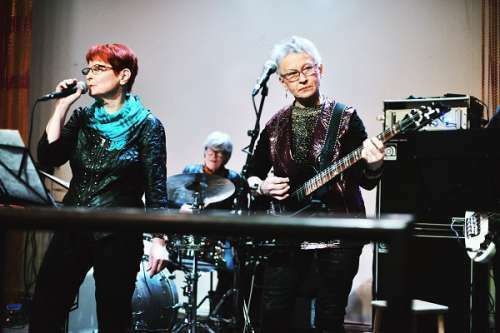 The punks of Pertti Kurikan Nimipäivät, the elderly rock musicians of Riskiryhmä and the professional musicians trained by Resonaarigroup point the way towards the music education of the future. A Special Music Centre in Kulosaari in Helsinki. The music school unit offers instrument tuition and teaching in the basics of music in one-on-one lessons and group lessons. The music school currently has about 260 students attending weekly lessons. The teaching draws on the Figurenotes system developed by Kaarlo Uusitalo. The centre also produces teaching materials, supports pedagogical research and development and offers complementary education in the field. The ArtsEqual research initiative is coordinated by the University of the Arts Helsinki. Its purpose is to examine how art as a public service could contribute to social equality and well-being in Finland in the 2020s. One of the largest research initiative on arts and art pedagogics in the history of Finland. The first period of the project was six years (2015 to 2020). In October 2017 it received funding of 2.6 million euros from the Strategic Research Council of the Academy of Finland. Funding was now granted for the period from 1 January 2018 to 30 April 2021. 'Hear this, I'm a composer', a project for children composing, presents on May 9, 2018 a concert with eight first performances by students of the Resonaari Special Music Centre at the Finnish National Opera main foyer. See video highlights of these works here.